Turkey’s Supreme Electoral Council (YSK) on Saturday reviewed the requests submitted from local election boards and decided to transfer ballot boxes in 19 provinces to other locations for the upcoming elections on Jun. 24, news site Duvar reported. According to Duvar, some voters, mainly in rural areas, will have to cast their votes 5 km. away from their places of residence due to the decision of the YSK, which did not take into account the total number of voters affected, while reviewing the requests. After meeting the head of the YSK, Sadi Guven on Saturday morning, Mithat Sancar, a Peoples’ Democratic Party (HDP) member of parliament for the southeastern province of Mardin told reporters that the decision might affect 270,000 people, majority of which are HDP voters. According to Sancar, since even a marginal difference such as 0,1 percent is important for the presidential election, YSK’s decision might affect the outcome of the poll. If the HDP fails to pass the 10-percent threshold in the parliamentarian elections, many of the seats in the mainly Kurdish southeast will likely go to the ruling Justice and Development Party (AKP), which traditionally comes second place in the region. “The second problem is the election threshold. The share of HDP voters among this 270,000 voters is very high. If those voters do not go to the places where the ballot boxes are to be transferred and cast their votes -which is a possibility- or change their votes because of feeling intimidated, then this will mean a serious intervention on elections,” Sancar said. Sancar noted that security concerns were said to be the main reason behind the decision to relocate ballot boxes and reminded that the voters in the same areas had been able to cast their votes in their own villages in November 2015, when there were ongoing armed clashes in the region. In 2015, the YSK overruled ballot box relocation demands made by local election boards due to security concerns in the country's eastern and southeastern provinces ahead of November 1 snap elections. Sancar also said that tilting the balance in favor of the AKP was the real reason for relocation and called the leaders of other opposition parties to speak up against this unfairness. A Turkish parliament without the main pro-Kurdish opposition Peoples' Democratic Party (HDP) would be a shame for the country, Cumhuriyet newspaper quoted party co-chair Pervin Buldan as saying. Turkey will hold both presidential and parliamentarian elections on June 24 with Turkish President Recep Tayyip Erdoğan looking to assume sweeping new executive powers that will come into forces after the polls. HDP former leader Selahattin Demirtaş is one the challengers in the presidential race, but is fighting his campaign from a cell in a top security prison where he being held while being tried on terrorism charges. Opposition parties failed to agree on a joint candidate to face Erdoğan, but if the president fails to win an absolute majority on June 24, they could unite behind a single candidate in run-off polls two weeks later. “In the first round, we will come together around Selahattin Demirtaş. He is a politician loved in Turkey. He is a politician who raises trust and hope in society. 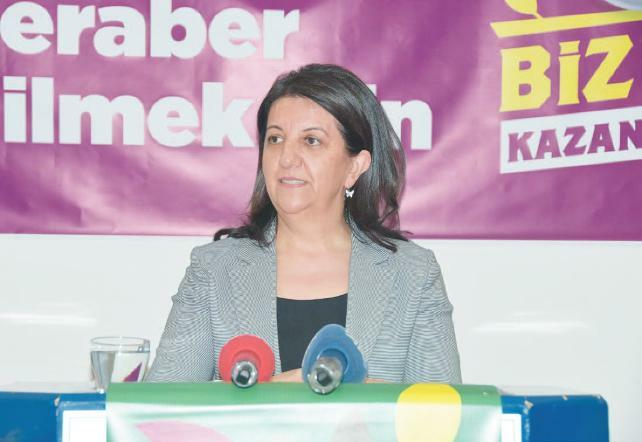 We do not talk about the second round at the moment, we do not discuss it,” said Buldan. With 11 of its members of parliament and thousands of its activists jailed in a wide-ranging government crackdown on dissent, the HDP will find it hard to match its performance in 2015 parliamentary elections when it became the first pro-Kurdish party to gain the necessary 10 percent of the national vote to take up seats in parliament. If the HDP fails to pass the 10-percent threshold, many of the seats in the mainly Kurdish southeast will likely go to the ruling Justice and Development Party (AKP), which traditionally comes second place in the region. “No one should ignore the fact that 70 to 80 deputies will be won by the AKP, if HDP votes remain under 10 percent,” she said. Buldan welcomed the visit by the main opposition presidential candidate Muharrem İnce to Demirtaş in prison. “What Mr. İnce did was a great gesture. I think the rest of the candidates should do the same. Demirtaş should be free and manage his campaign,” she said. İlk turda Demirtaş etrafında kenetleneceklerini söyleyen Buldan, ‘2. turu konuşmadık ama 2 adaydan birini tercih edeceğiz’ dedi.